Most people are unaware of their teeth grinding and that it may have serious underlying causes and complications. 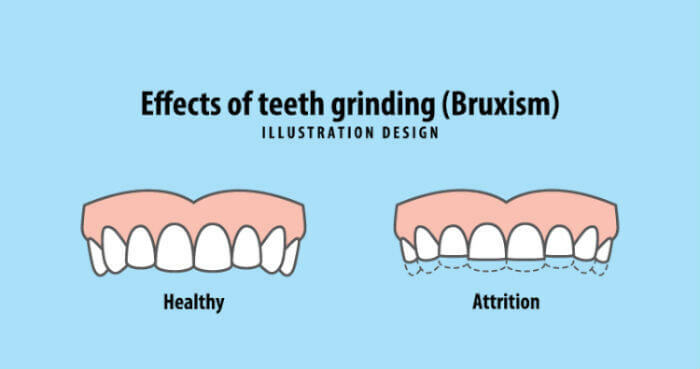 Bruxism or teeth grinding is a condition wherein your teeth would clench, grind or gnash involuntarily during sleep. Perhaps you have heard so many theories of why some people grind their teeth and you may have conclusions of your own about this repetitive motion. Is it a sign of an idling brain, stress, anxiety or a disorder? Understand what grinding is, its causes and what you can do to protect yourself. Stress or anxiety: some people grind or clench their teeth as an involuntary reaction to stress. Others do it voluntarily until it becomes a habit. When stressed, they clench their teeth at daytime and the involuntary grinding worsens when they’re asleep. Do you snore when you’re asleep? While it is not clear if snoring or sleep apnea (poor breathing at night) could cause teeth grinding. But, most of the time, people who snore also grind their teeth. Drinking coffee. Don’t drink caffeinated beverages in the afternoon or before going to bed. It is a psychoactive drug that increases alertness and muscle activity. Not only does it lessen your sleeping time, but it could cause teeth grinding while you sleep as well. Antidepressants and other drugs used to treat mood disorders can cause teeth grinding. What can you do to fight off bruxism? There are a variety of mouth dental guards available on the market that can help reduce bruxism. You can also get a custom fit one from your dentist, but the price will be much higher. Alternatively, there are night guards that can be boiled at home, and custom fit in your mouth. We highly recommend these. Your dentist would ask you to wear protective teeth device or a bite guard on your teeth. While they don’t really stop your teeth from grinding, they can keep your teeth from damage. Over time, it can stop nightly clenching as well. All these activities can ease tension from your body and improve your sleep. Poor dental bite, misaligned teeth, and gum irritation could cause teeth clenching. Your dentist can make simple adjustments and corrections to solve your grinding issue. This procedure involves relaxation of your facial muscles to improve its position.